This weekend the largest quilt conference in the world takes place in Savannah, Georgia and there'll be a little piece of Nova Scotia in the mix. 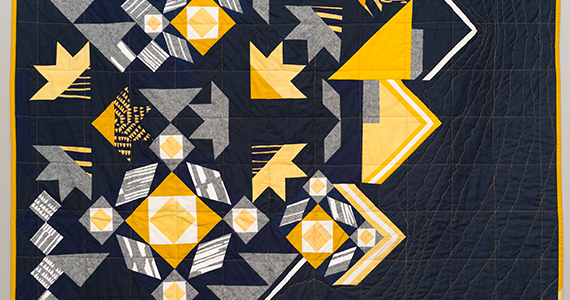 Two, actually: Andrea Tsang Jackson, the maker behind 3rd Story Workshop, will be showcasing her bright, intricate work at the Modern Quilt Guild's Quilt Con—hers are among the 350 that were chosen from a pool of over 1,500. "I'm the first that I know of coming from Atlantic Canada," says Tsang Jackson, who won't be travelling with her work this time around but is elated to be sending two special pieces south. A project nearly two years in the making, she started Crow Quills Analog in 2014 when she found out she was pregnant with her second baby, and drew inspiration from artist Andy Gilmore. "I wanted to make a sort of physical manifestation of that work," Tsang Jackson says of the piece, which uses over 2,000 triangles of fabric in 25 colours. The second piece on display, Land & Sea, is a collaboration with fellow Nova Scotian crafter Alissa Kloet. "That quilt was really about place and what it is to be in Nova Scotia. There's a land portion and sea portion and micmics the interplay between the two," she says. "It can be really lonely being a crafter, working alone in your studio all the time. Having Alissa, and the community of crafters in this region is like having colleagues." Quilt Con runs February 23-26.